ChannelEngine has multiple options to adjust the price of a product that’s being sent to a channel. Price rules will add or subtract an amount in the used currency. It is also possible to add or subtract a percentage of the price. The price rules for all channels can be managed via the left side menu and selecting ' Channels' > 'Price rules'. If you only want to manage the price rules for a specific channel, you can navigate to the tab 'Pricing' > 'Price Rules' in the top menu that's visible when you open a channel. Regardless of the view, it’s always possible to add a price rule or a currency conversion or change existing ones. Select “ + Add” / “+ Add price rule” to add a new price rule. Multiple price rules are allowed as long as these rules only consist of one type. This means you can have an unlimited amount of channel price rules and listing price rules, but not combined. If a product is included in more than one listing, there is a very high chance that for both listings different prices will be calculated (based on applied price rules). In that case, the highest calculated price will be used for the export, so if you set a discount in a price rule for such a product it will not be applied in the export. When adding a price rule it’s possible to pick your own amount (left) or percentage (right) to add or subtract. 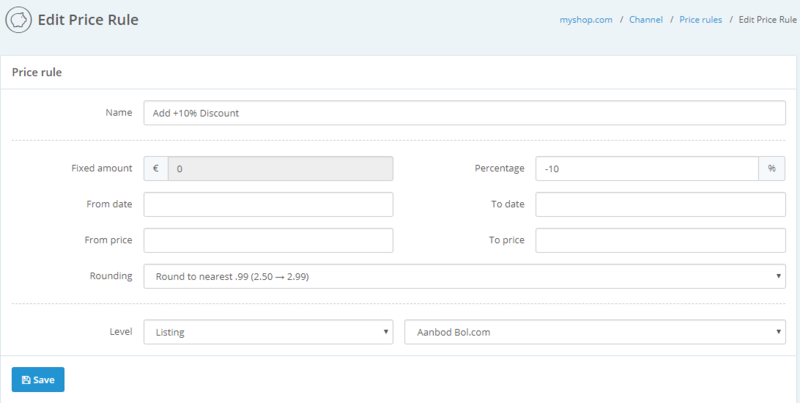 There is an additional option to exclusively apply the rules to products within a certain price range. It is also possible to select a range of dates so it’ll automatically go back to the normal price after a set date. This way, you can offer discounts for a certain amount of time, without having to change everything back at the end. At “level” you pick the channel or listing level of your pricing. After applying the price rules, it’s also possible to round the number using one of the options that are available to avoid weird prices. For example, round UP to .99 (€2,64 -> €2,99) or DOWN to nearest .05 (€6,83 -> €6,80). Please note: percentage applies to the current price. Example: The original price is € 2,-. Filling in a value of 30 in the percentage field will result in the new price being € 2.60 euro. It is also possible to convert the currency to the local currency of a channel. This conversion can only be applied on a channel level, so it will only be applied to a certain country. By choosing which currency to convert to, ChannelEngine will regularly update the exchange rate, so prices will always be up-to-date. Please note that the currency that is being converted from, is always the default currency set for your account. If that is set to EUR, you can set a conversion to GBP. 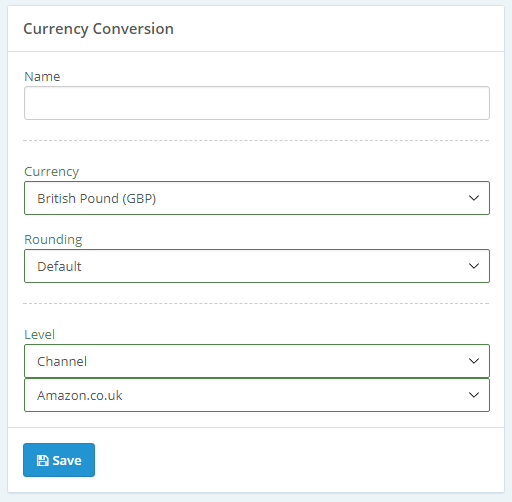 If your default account currency is set to GBP, there (logically) will not option to convert to GBP, but will be an option to convert to EUR. Note: your default currency can not be managed from your ChannelEngine account at this time. If you would like this changed, please contact our customer success or support team.